"Who's the girl in all your Camino de Santiago pics with Bernardo?" asks my friend, Rhonda, who never misses a beat. "No, clue," I reply, "she just kept photobombing my shots!" Not to say that I didn't love trekking through the Pyrenees with my media naranja, but when we landed on the island I was like a fish back in the water, eagerly shedding my hiking gear in favor of the crisp white linen I usually don in the glorious days of summer months, a most propitious transition from rough to glam. On the plane from Bilbao to Athens, we begin to watch "Summer Lovers," which was shot in Santorini, the island neither one of us knew and were about to discover. A "B/X" movie at best, its greatest value was the beautiful backdrop of Greece, and throwback to a very young Peter Gallagher and Daryl Hannah (though now I realize that the leading lady's never ending legs were most likely the reason my husband suggested we rent it.) It takes us the entire week to get through the "acting" between cackles and guessing which places we could identify while on the island. And while I often feel that our virtual world is far too effective at eroding the element of surprise when traveling, in the case of Santorini all the imagery in the world doesn't begin to describe the magnificence of an island in which time stands still and carefree beauty abounds with an aura of romance that gives nearby city of lovers, Paris, a run for the money. To say that Santorini is breathtaking is an understatement. Every angle is a feast for the senses. From cascading bougainvillea to azure waters, royal blue domed churches to snow white cliffs, the offerings are boundless. Aside from the setting itself, Santorini’s structures are as unique as their origin. 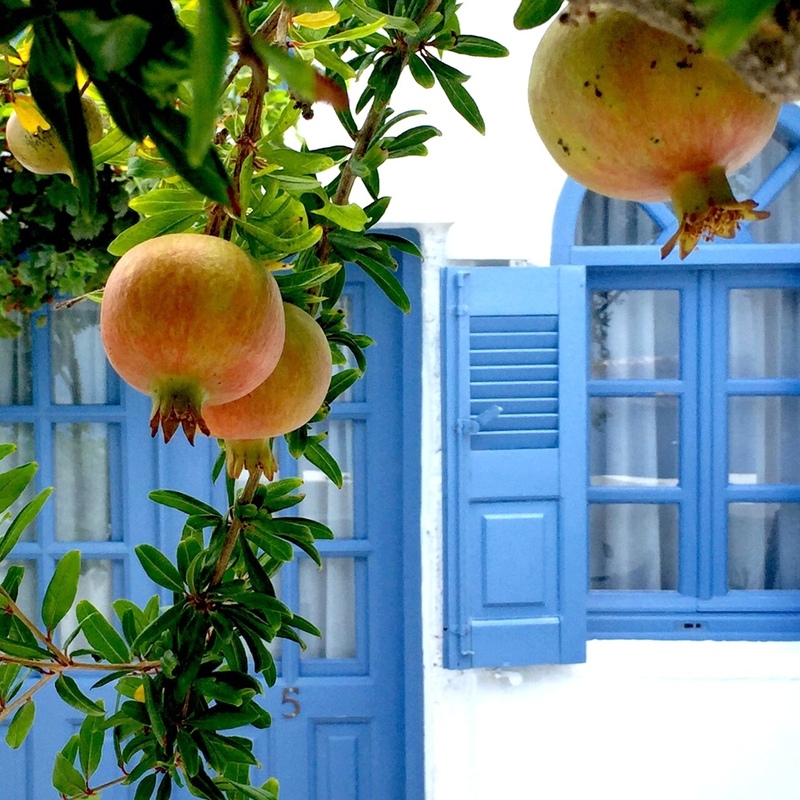 The signature whitewash look of the Cyclades began for bioclimatic reasons to make houses more heat resistant. Santorini, however, was the exception decades past, rife with vibrant colors like warm ombre, bright red and adobe hues, some of which are still seen today. But in the late sixties and early seventies, under military rule, the government demanded that all houses be painted white. Still, the signature blue hues of the island's church domes wove their way into the cool white landscape in the years thereafter, creating the picturesque color scheme of present-day Santorini. Very well located in Oia, arguably the most beautiful, romantic municipality on the island, our hotel, Mystique, an adult only resort built into the hillside with cave like rooms and all the charm you would expect to find in Oia, boasts two pools, private jacuzzis, a boutique and spa offering an array of services with a wonderful team of talented therapists. The rooms are gorgeous, though keep in mind that if you are not one to embrace the fishbowl effect, you best book one beyond the hotel's main path. Ours was thankfully tucked away at the end of the hotel with breathtaking views of the cove below, an upgrade worth every penny. Some things don't change. We zipped around town on a Vespa, just like we do back home in San Francisco, and while I was apprehensive at first, the feeling of fresh air while hugging my better half on the road was unbeatable. That said, we are both licensed motorcycle drivers and I wouldn't recommend renting one if you are not. ATVs are popular as well but are very dangerous as they are highly susceptible to rolling over. And yes, we always wore our helmets...don't let this stationary photo op fool you. The dining experience is as exquisite as the island itself. 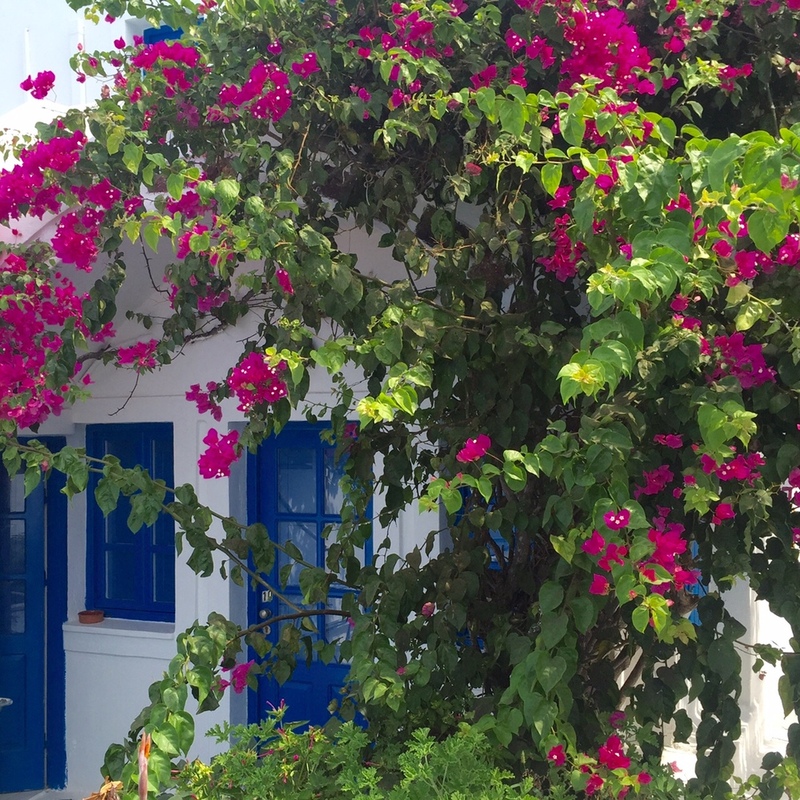 If we could choose only two restaurants on the island, they would have to be Ambrosia for dinner and either Ammouni Fish Tavern or Katina Taverna for lunch. Ambrosia: This elegant and impossibly romantic cliffside restaurant with swoon-worthy fare and fun people watching was so exquisite. we dined there twice and would return in a heartbeat. On the other hand, the very casual Ammouni and Katina are delightful for lunch. 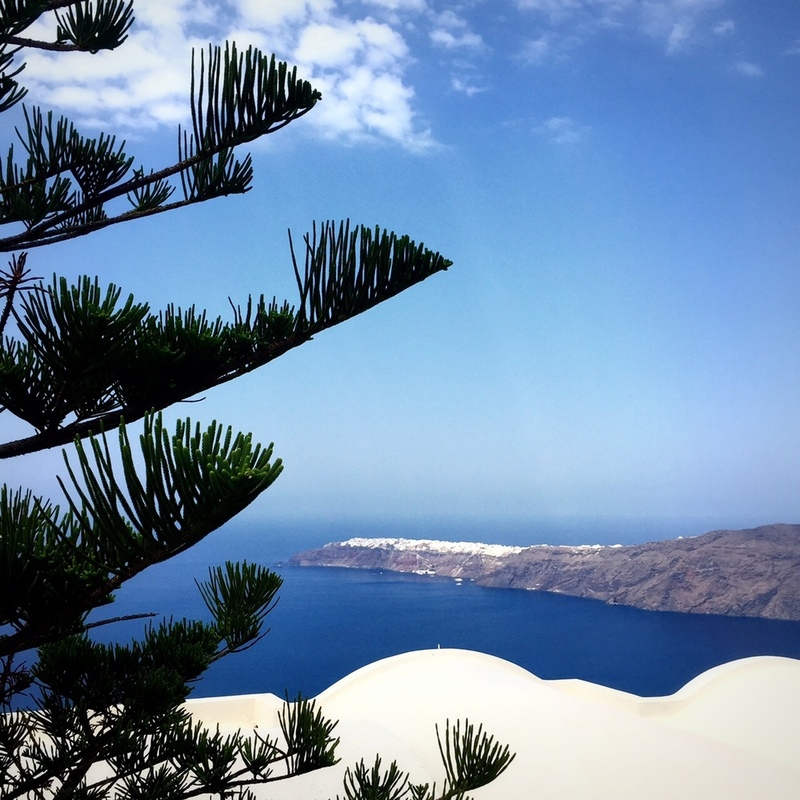 Whether you jet down on a Vespa or take a trek down Oia's famed 220 steps to get there, you will not be disappointed. I felt as though I had stepped back in time when fishermen broke into spontaneous laughs serving up their daily catch with pride. Can you believe the view?! 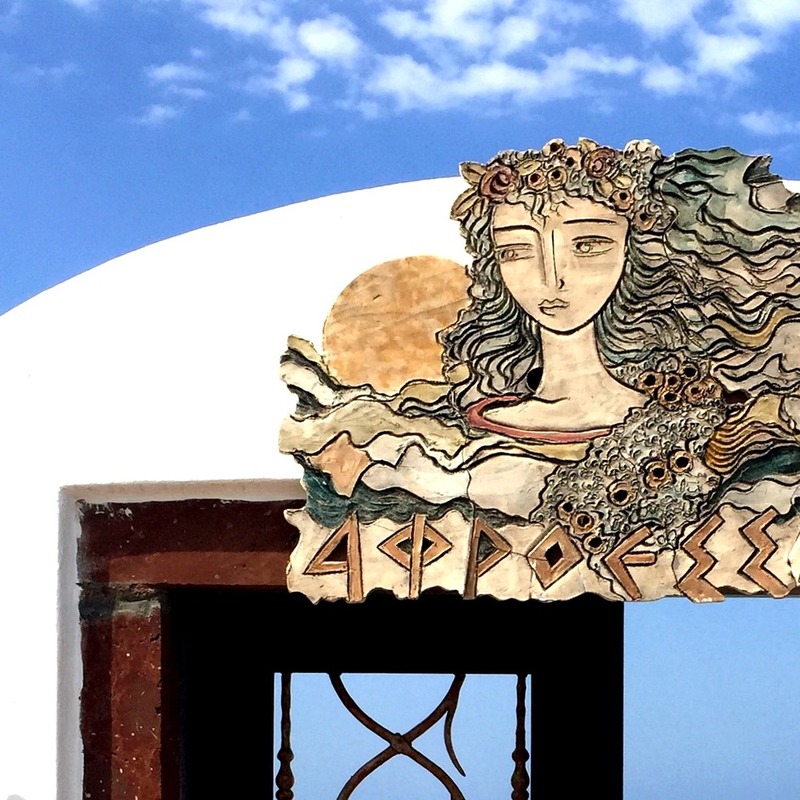 Other delicious spots worthy of mention are Lotza in Oia, To Psaraki in Perissa Bay, and Naoussa in Fira, but what they all have in common is the warmth of the locals. Oia was the perfect reward for our arduous six-day hike through the Pyrenees (A Trip of a Lifetime • Week One) and I assure you that we are not virtual spoilers, for the splendor of both Santorini and the Camino de Santiago are without limits!